A few months ago I wrote about my soccer coaching experiences with my daughter’s U7 team. To conclude that article I mentioned we were about to start playing indoor soccer. Well, that indoor season ended Friday night… and I’m happy to announce that our team of 6 and 7 year old girls won the championship! I mention their ages since the team we played in the championship game was made up primarily of 8 year olds so winning the game was no small task. 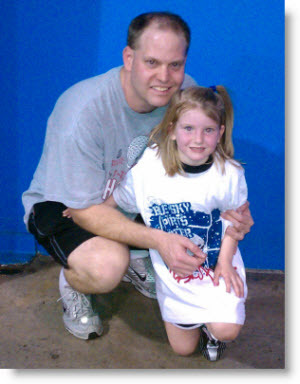 As an aside, the picture to the left is me and my daughter in her championship t-shirt that she won’t take off now! Anyhow, as is usually the case, I personally learned many things this past season. But one particular lesson stands above all. The main lesson I was reminded of is that nothing is more important than hard work and practice. You see, we’re not a club or academy team… yet in preparation for the big championship game we practiced twice a week. During those practices we worked on fundamentals and scrimmaged. At this age, nothing is more important than increasing the number of “touches” the girls have with a soccer ball. Additionally, all our girls had homework to do each night including things like doing at least 50 “toe taps” before they went to bed. In other words, these little girls worked very hard. Immediately after the championship game I asked the girls, “Do you know why we won?” I then went on to explain that we practiced so hard and worked together as a team… and that’s why we won. You see I find that many people, including grown-ups, fail to grasp the importance of hard work and why practice definitely makes perfect. I’ve known people with amazing intelligence… yet they fail to meet their own life expectations because they’re not willing to put the work in. Instead, they expect their “talent” to carry them to success… which it rarely does in the long run. So, while winning championships is great… the most important life lesson I hope to teach these young girls is that anything is possible with hard work and practice. What’s interesting about this story is that it’s 4:37 AM as I type this sentence in the parking lot of the indoor soccer facility my girls play at. Why am I here at this ridiculously early time? Well, with more than 50 teams vying for practice time for the next indoor season that starts this Saturday, you have to arrive early to grab your practice slot unless you want to practice at 10:30 PM Sunday night. When family and friends learned I was planning to be at the facility this early almost all said I was crazy. They simply couldn’t grasp why I’d be willing to sacrifice sleep for 6 and 7 year old girls. But, to me, nothing is more important than giving these girls the opportunity to continue the life lesson that practice and hard work are the only way champions are developed, in sport or life. Besides… if you could have seen the looks on their faces after they beat that team of 8 year olds – who incidentally clobbered us twice by 7 and 8 goals earlier in the season – you’d realize why I’m so committed to them. Lovely post. Here in the UK football (your soccer) is such an important part of our lives. And the life lessons you speak of are at the heart of it all when it comes to the development of young footballers and people. Thanks, Graham. I have done quite a lot of reading on the sport… and most of it seems to be from folks based in the UK! Coaching kids is personally rewarding and a great learning experience. I find those skills desirable in implementing Lean in any organization. Good stuff. Thanks, Tim. 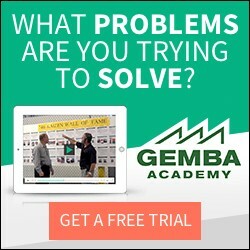 Yes, as much as I love teaching people about lean… teaching these girls has probably been the most ‘coaching’ fun I have ever had in my entire life! Beautiful story with some good learning, Ron! Those little girls are learning about a lot more than soccer – lessons the’ll carry with them a lifetime. I coached my daughter’s soccer team about 10 years ago and they were successful, but I didn’t have to be anywhere at 4:37 a.m. to sign up for practice times. Here in the wide open,sparsely populated great plains space is plentiful. Your commitment to these kids is commendable. Thanks, Mark. I appreciate your kind words! And I can’t wait for spring outdoor season to start as we’ll definitely find a nice park to practice at. No need to reserve those… ha! This article really makes me to work hard and do more practice to win anything in this world. Thanks to our author to make us understanding the real things with live example.